Where and When Do Auroras Occur? What Gives Auroras Different Colors? What Are the Common Shapes of Auroras? Why Are Auroras Important to Everyday Life? How Can You Photograph the Beautiful Aurora? How Much Do You Know About Aurora? 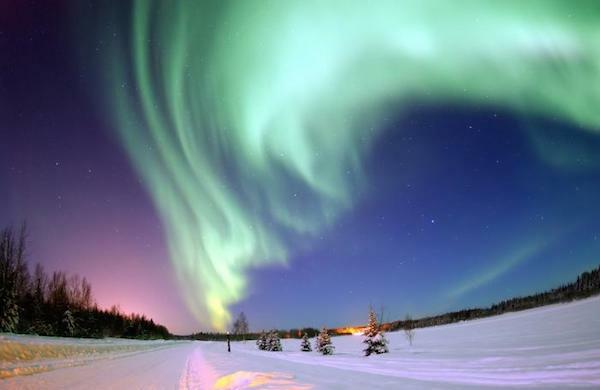 The making of an aurora is an intricate dance of particles and magnetism between the Sun and Earth. The Sun continuously produces a solar wind, made of charged particles (plasma) carrying the Sun’s magnetic field. As the solar wind nears Earth, it causes the magnetic field of the Earth to be drawn into a giant teardrop shape, squashed on the side closest to the sun and drawn out into a long tail on the side farthest from the sun. This giant magnetic bubble is called the magnetosphere. Watch this video a few times to help you understand the description below! As the solar wind interacts with the magnetosphere, the two magnetic fields become strongly linked, trapping particles of the solar wind and Earth’s ionosphere in the long inner tail of the magnetosphere. The stretched magnetic field lines become unstable and ultimately snap like rubber bands into two separate regions, one controlled by the Earth's magnetic field, the other connected to the solar wind. The magnetic field in the near-Earth region shrinks rapidly, accelerating the charged particles toward Earth. Some follow spiral paths along the magnetic field lines connecting the north and south magnetic poles to the upper edge of Earth’s atmosphere. The aurora light is emitted when the charged particles collide with atoms and molecules of gases in the Earth’s upper atmosphere. Learn more in the next question! 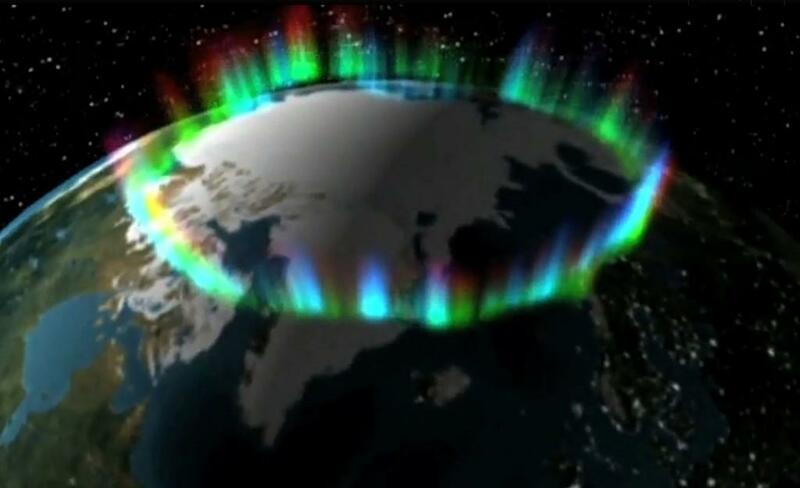 Aurora forms between 100 to more than 500 kilometers (60 miles to more than 300 miles) above Earth. For perspective, 500 kilometers (300 miles) is roughly the altitude of the International Space Station. The higher the aurora, the farther away it can be seen from the ground. Excellent viewing in the fall and spring happens in Fairbanks, Alaska, Yellowknife, Canada, and Tromso, Norway, and less so at lower latitudes. During geomagnetic storms particles from the magnetosphere can be highly energized when colliding with atoms and molecules of gases in the atmosphere. This causes a more intense aurora, which can be seen as far south as the US-Canadian border and northern United Kingdom. Though rare, aurora was seen in Alabama in 2011! the season — there is a slight preference during the spring and fall equinoxes. 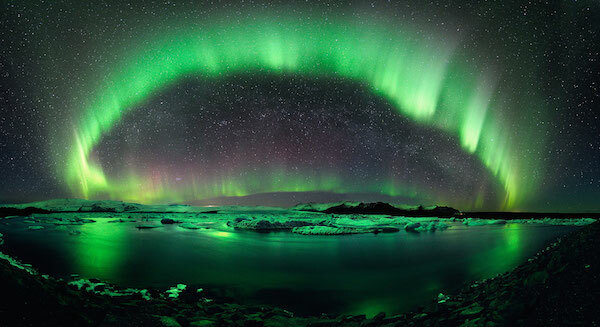 Most often aurora are seen around midnight, but can be seen both earlier and later in the night. Aurorasaurus forecasts, improved by citizen reports, will alert you to events occurring in your area! 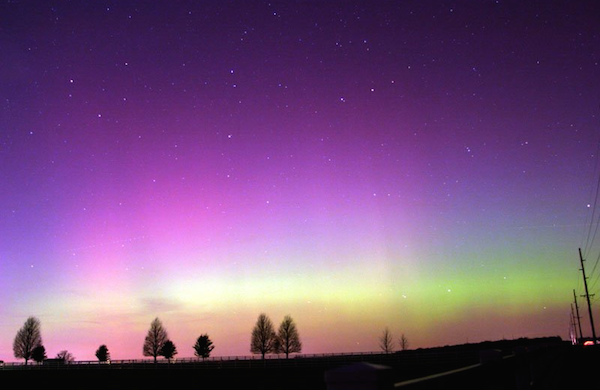 An aurora can appear in a variety of colors, from an eerie green color, to a spectrum of blue and purple to pink and red. 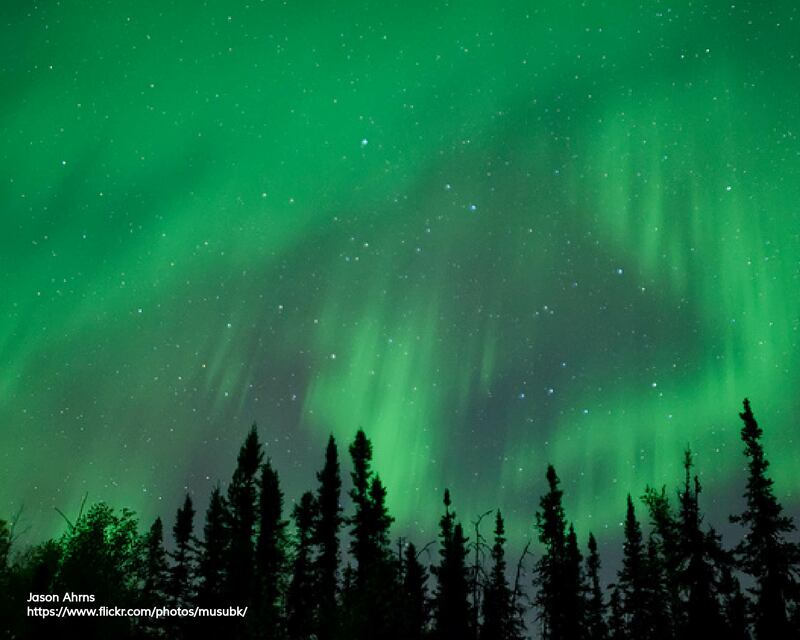 The light of the aurora is emitted from gases in the atmosphere when they are bombarded by particles from space. 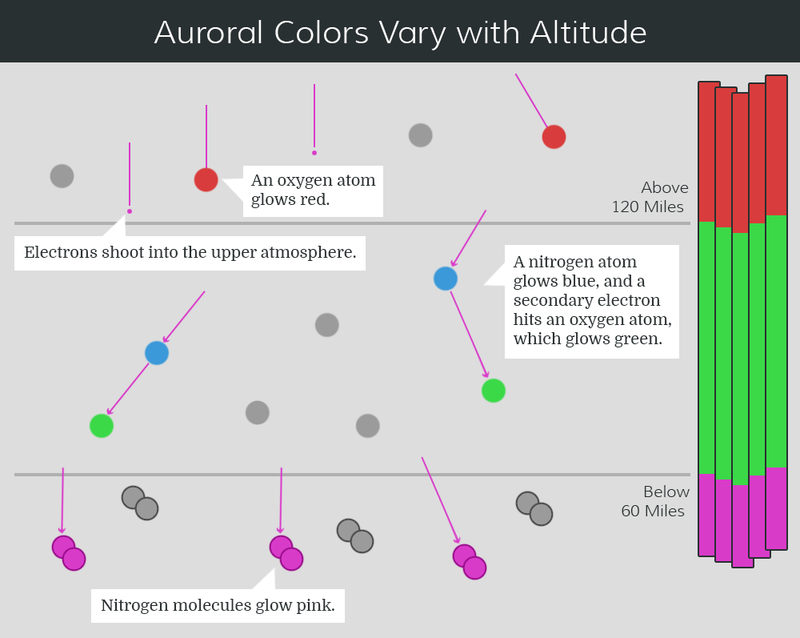 The colors displayed are related to the type of gas being bombarded and the altitude. Oxygen excited to different energy levels can produce both green and red colors. The green color occurs between 120 and 180 kilometers (75 and 110 miles) altitude and is caused by oxygen. The red color occurs above 200 kilometers (120 miles). Excited nitrogen gas between 120 and 180 kilometers (75 and 110 miles) glows blue. Below 100 kilometers (60 miles), nitrogen can give off both red and blue light, giving the lower edge of the aurora a reddish-purple to pink glow, especially during intense aurora. These are discrete arcs, which typically have a definite lower border and can stretch high into the sky like curtains when viewed from the side. From directly underneath they are very narrow. They are usually green but can have pink on the lower border when they are very active and bright. They can race across the sky faster than your eye and make your jaw drop in the process! These are diffuse glows. They can be green, whitish, or blood red and are spread over a wide area. They usually have little motion, are quite dim, and might even be confused with clouds. If you can see stars through the glow, then it is likely aurora not clouds. Diffuse red glows, which are visible at great distances, cannot be forecast currently. These are pulsating patches. Each patch turns on and off every few seconds, and has irregular shapes that reappear. They are quite dim and usually occur late in the night (early in the morning) after the main arcs have subsided. What causes these unique shapes is unknown. Occasionally, the Sun’s activity generates strong electrical currents known as geomagnetic storms. A storm creates an opportunity and a threat. It allows us to view a strong and beautiful aurora at lower latitudes, but can threaten many of the ground and space-based systems societies depend on. These storms are important because they can disrupt or destroy our communication, navigation, pipeline, electrical, and transportation systems. The NOAA Space Weather Prediction Center provides official space weather forecasts for the ways in which space weather may affect U.S. systems. During a recent major geomagnetic storm in 1989 electrical currents melted transformers in New Jersey and wiped out power through much of Quebec, leaving 6 million people in the dark. 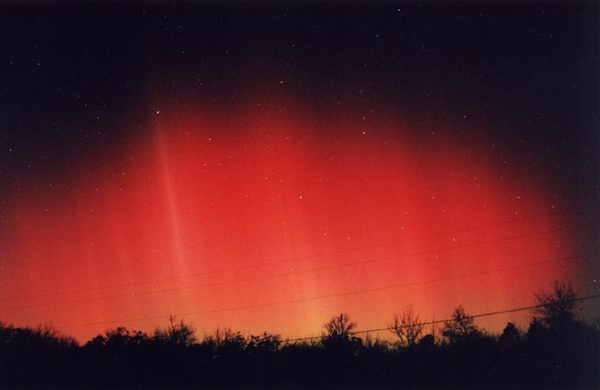 The largest geomagnetic storm of recorded history, the Carrington Event, occurred in 1859. This storm was so big that it lit up the skies with aurora from the poles to the tropics. Electrical currents from the storm caused sparks and fires in telegraph systems and disrupted communications. Experts worry that the impacts of a Carrington-like event today could rival or exceed the worst natural disasters humans have ever faced. However, these events are VERY rare. Your contribution to Aurorasaurus can help us to better understand and prepare for these storms. 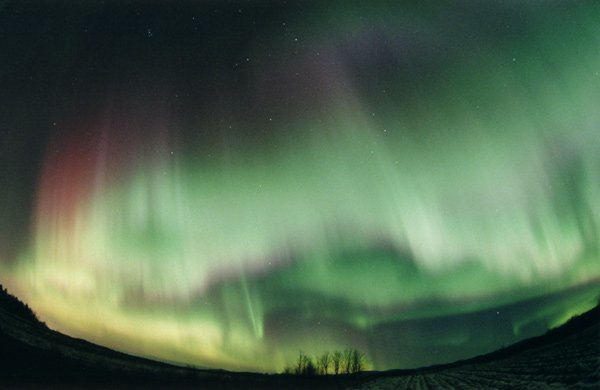 With the right tools, you can generally capture aurora in photographs. Your camera can even pick up very dim colors of the auroral spectrum that your eyes cannot see. Keep in mind that auroral images that you see online can be heavily processed and look much different than the real thing. A camera capable of taking a long exposure image. Point and shoot cameras will work; a cell phone probably will not. A modern DSLR camera with a lens capable of a low-number f-stop (like f2, f3, or f4) is best. A camera tripod. (Very important!) The camera must remain very still, and the human hand is not steady enough. A headlamp to see what you are doing. Red light is helpful for keeping your night vision. A camera shutter release cable, extra memory, and extra batteries can be helpful. The camera should be set to manual operation with a focus on infinity. Set the camera shutter to open for a long exposure, probably between 2 and 15 seconds. How long to keep the shutter open will require some experimentation, as the auroral brightness and camera settings can vary greatly. Now that you’re started, here are a few sites (below) with more good details! Pass a quiz and earn points on the Leaderboard! Note: Quizzes can be taken multiple times, but points are only awarded the first time you pass. You must be logged in to access quizzes. To offer feedback on quizzes, please email us at aurorasaurus.info@gmail.com.